For Christmas last year I was given almost every small kitchen appliance any cook or baker dreams to own, including: a beautiful stainless steel Kitchen Aid stand mixer from Russell and my in-laws; an absolutely stunning red 12-cup Kitchen Aid food processor from my parents, sister, and brother-in-law; a mandolin slicer from my parents; and a Cuisinart electric cake/cookie decorator from my grandmother. Since then, I have used each of these items often and wonder what I ever did without them! Admittedly, I was somewhat hesitant to use my food processor at first...I can’t really explain why-- I think it may have been the daunting idea of having to clean it afterwards. Once I discovered that just about every part of it is dishwasher safe, we became best of friends and I use it almost every day! I’ve made smoothies; chopped dried fruit; shredded cheese; and sliced, shredded, and chopped vegetables. The possibilities for the device seem endless, and I now look for recipes so that allow me to use it. 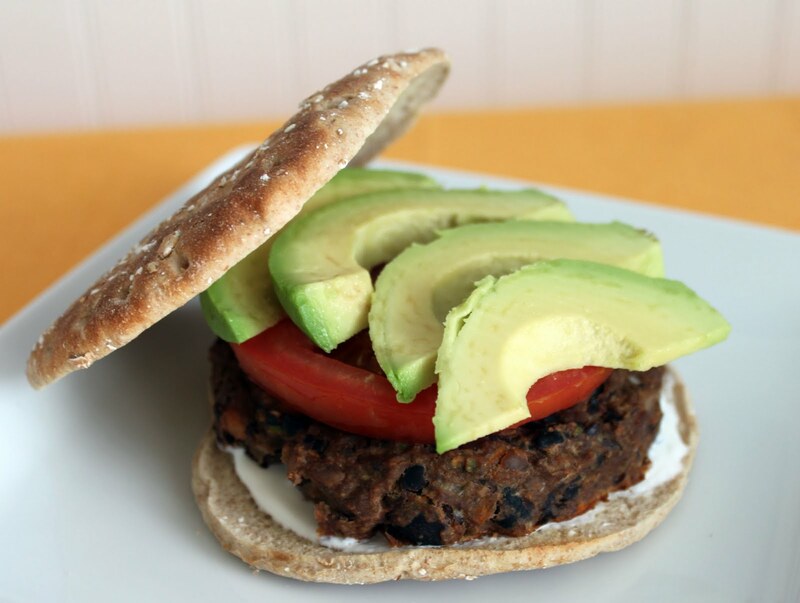 After a weekend out of town and away from my kitchen, I was longing for a date with my food processor-- black bean burgers seemed like the perfect recipe to put it to work! Russell arrived home from work one evening and immediately asked what we were eating for dinner. As soon as I responded with black bean burgers he (on cue) asked if they contained any meat. When I told him they did not, I could see his skepticism of my meal choice. The recipe makes 8 burgers and I was planning on freezing four of them to have for a later meal. However, my skeptical husband devoured four burgers all by himself--yes four! If that doesn’t let you know what a success they were, let’s just say I will be making them again soon. The outsides of the burgers develop a nice crispness, while inside they remain moist and flavorful. The lime sour cream (recipe found here) really compliments the flavors as well. Preheat oven to 350 degrees F and line a baking sheet with non-stick foil or parchment paper. In a medium bowl, mash black beans with a fork to make a paste. Add carrot mixture to the beans, as well as the remaining ingredients. Stir to combine. Form mixture into 8 burger patties (they will be wet and sticky). Place on baking sheet and bake for 25-30 minutes or until edges begin to brown and are crispy. Serve with avocado, tomato, lime sour cream, or any other desired toppings and enjoy! *The original directions state to transfer the carrot mixture to a fine mesh strainer to remove any excess liquid but I accidentally skipped this step and did not have any issues with my burgers.